Looking after people's pets is one of the most rewarding and fast growing occupations in United Kingdom today. Our Dog Grooming Course will offer the learner a rewarding way of learning everything required to enhance their pet care knowledge base for use in the Dog Grooming business. Our Dog Grooming Course is suitable for anyone, whether they are considering a career working as a dog groomer, or someone who wants to gain a much better understanding and knowledge of grooming. It will provide you with the essential knowledge that you need to care for clients pets in a responsible welfare conscious way. Learn what you need to start and run your own business. Our Dog Grooming Course covers everything you need to know about dog grooming and business skills. It also helps you become more security minded, to keep the right records and what to do in an emergency. This Dog Grooming course has been mapped to the Lantra, Animal Care and Welfare, National Occupational Standards (the units are indicated in bold next to the learning outcomes). 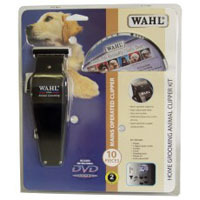 FREE Wahl Multicut Electric Pet Clipper Kit With DVD with our Dog Grooming course (R.R.P £27.55). This is a mains operated clipper, completely versatile classic design with good balance. It has an adjustable taper arm for variable cutting lengths, high precision, rustproof, chrome plated blades.